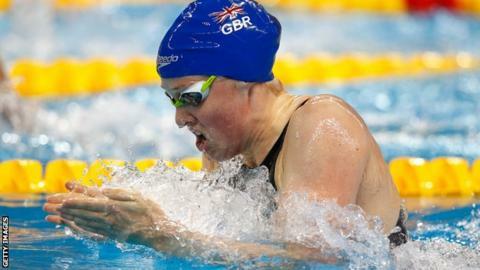 Britain's Hannah Miley took 400m individual medley bronze on the opening day of the World Short Course Championships in Doha, Qatar. The defending champion finished third behind Spain's Mireia Belmonte - who set a new world record of four minutes and 19.86 seconds - and previous world record holder Katinka Hosszu. Adam Peaty, 19, set a new British and championship record of 56.43secs in the 100m breaststroke semi-final. The final takes place on Thursday. Belmonte also beat Hosszu into second in the 200m butterfly with another world record time of 1:59.61, eclipsing the record of 2:00.78 set by Zhige Liu of China in 2009. South Africa's Chad le Clos took the first medal of the championships in Wednesday's men's 200m freestyle final. Lithuania's Plymouth-based Olympic champion Ruta Meilutyte then set a new championship record time of 28.81secs in the women's 50m breaststroke. She will face Jamaica's Alia Atkinson in Thursday's final, but British hope Sophie Taylor failed to qualify. And in the women's 4x200m freestyle relay final, Netherlands claimed gold with a new world record of 7:32.85 - more than three seconds faster than China's previous best set in Dubai in 2010. In the rest of Wednesday's semi-finals, GB's Georgia Davies was the fourth-fastest in qualifying for the women's 100m backstroke final on Thursday, but Adam Barrett narrowly missed out on a place in the men's 100m butterfly final, as did Chris Walker-Hebborn in the men's 100m backstroke. British Swimming has taken an 11-strong team to Qatar, boasting 11 Commonwealth and seven European titles between them - although Scottish Commonwealth gold medallist Ross Murdoch is missing because of a chest infection. Six-time world champion Mark Foster said the current GB swimming squad is the best he's seen for 30 years.